Residents’ actions highlight growing expectations that a more inclusive model of decision-making is both possible and achievable. For a brief period in January 2011, the revolutionary promise of Egypt’s uprising seemed limitless. But the eighteen months that have followed those eighteen days have seen hopes of wholesale change largely extinguished as the old order slowly reconstitutes itself. Yet this is not the whole story. If we confine examination to the arena of institutional politics, little will appear to have changed. But if our gaze drifts to the shifting sands upon which community-led activism is taking place, a different picture begins to emerge. The undulations of revolutionary energy may not have produced a new political order, but they have significantly weakened the constraints within which grassroots dissent can emerge and develop. During the Mubarak years, formal opposition movements were tightly regulated by the state and those operating independently faced formidable obstacles to action. This is not to say that mobilization was impossible – labour activism steadily increased throughout the 2000s and on a more informal level, urban communities tacitly engaged in daily low-level challenges to state authority – but the very real possibility of night-time arrests and torture at the hands of the state security services remained a constant threat. Egypt’s revolution may not have led to a fundamental restructuring of the political arena but is has delivered a significant blow to what the barriers to community-based activity. Community-based movements organsie themselves outside the confines of parliament, a forum that is seen as increasingly removed from the day-to-day issues for which residents are campaigning. Protests and sit-ins are still subject to careful policing, but this now occurs within a context of shifting power relations between citizens and the state that polices them. The increased ability of organised movements to elicit specific concessions from elites represents one key development in the post-Mubarak era. A closer look at one such campaign in El Dabaa, a markaz on Egypt’s northwestern coast, reveals the small but significant gains that community mobilization can now achieve. El Dabaa’s campaign targets a nuclear development project dating back to the Sadat era. In 1981, a presidential decree allocated 65km of Bedouin land for the construction of a nuclear plant. The project was sold with the promise of significant developmental benefits for the area, but its reality has been very different. Despite little evidence that construction has even begun, the indigenous population have been required to demolish the homes and land which sustained their livelihoods. Compliance was compensated with a mere LE2000 per house. In Egypt, this practice of forced resettlement is nothing new. Similar cases have been well-documented in Suez, Aswan, and Giza. But for the affected communities, its debilitating effects are always experienced afresh. Existing modes of production tend to be rooted in the land on which they have lived for generations, leaving communities with no choice but to cultivate new groves and crops from scratch after resettlement. Forced resettlement also disrupts community networks. These grievances have lain at the heart of the El Dabaa campaign. They were then accelerated in 2003 when families who had resisted orders to destroy their own land were forcibly evicted without reparation or compensation. Egypt’s January revolution presented fresh chances to push back against the nuclear project. 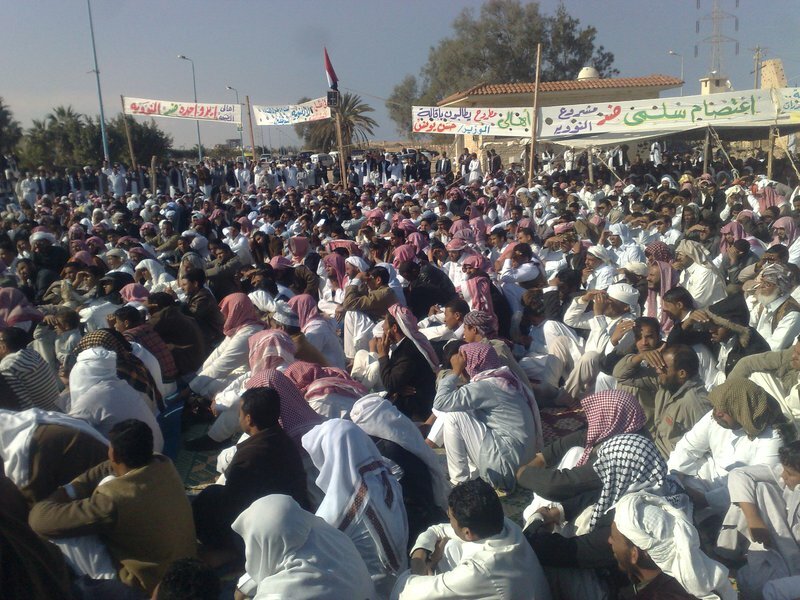 Following the temporary withdrawal of El Dabaa’s security services, residents formed popular committees to defend their land, forging links which would develop into a series of sit-ins, marches and protests continuing throughout the year. The movement eventually attracted the attention of a coalition of NGOs. These have joined forces with the residents to demand the termination of the nation’s nuclear project. The El Dabaa strategy raises important questions regarding the logic of authority and compliance in revolutionary Egypt. What happen, for example, when citizens demand a system of effective reparations for the community as a whole, in place of one-off compensation payments for individuals? This means guaranteeing the Bedouins new plots of land, a move that would help the community regain the sense of cohesion that was endangered by resettlement. The result of this confrontation will reveal much about the state’s ability to deprive communities of their rights when faced with growing local resistance. Further, how does a state with deeply authoritarian roots react when communities challenge the increasingly malleable boundaries of authority with clear demands for a more inclusive model of decision-making? In El Dabaa, residents are putting forward their own ideas for how the land should be developed. This proactive approach has also been seen by campaigns elsewhere. In North Giza, Idku and Damietta, community groups have opposed large energy and environmental projects that were established after only the most basic of local consultations. The success of these campaigns has been variable, but all have managed to limit the ability of their respective targets to operate in the same manner as before - a small but significant shift in the potential of such movements to curb abuses of state power in the post-Mubarak era. Residents’ actions highlight growing expectations that a more inclusive model of decision-making is both possible and achievable. What we see today forms an important part of the legacy of Egypt’s uprising. The revolution may not have occurred in the realm of politics, but in the confines of the imagination. Triumphs against state authority remain limited and piecemeal, but for many communities, the key difference is that they are now seen as possible. But for all the fledgling promise of El Dabaa’s campaign, it also serves as a reminder of the extent to which political elites remain in control of Egypt’s overall social and political framework. Two weeks ago, the residents arrived in Cairo to stage a protest outside a conference held by the nuclear authorities to counter the campaign’s accusations. This protest was immediately shut down. Adding further pressure, Egypt’s Nuclear Power Plants Authority yesterday spelled out the consequences of further action, emphasizing their power to prosecute. On a broader level, the campaign’s strategic approach has also been shaped by the state’s ability to limit the narrative boundaries within which resistance takes place. As a Bedouin community, the residents of El Dabaa are theoretically afforded a certain degree of protection by the Egyptian government under international law. But since the campaign is opposing a nuclear project that had been cast as a symbol of national strength, the state media has selectively depicted the resistance as an act of treachery without reference to the social and economic damage it has inflicted at community level. For this reason, there has been fierce debate amongst El Dabaa residents as to whether to identify as Egyptians or as Bedouins for the purposes of the campaign. Opting for the former, they have been forced to distance themselves from the very identity which would – on some level – afford them recourse to rights protection at international level. This, of course, highlights the gulf between the theoretical protections afforded by international law and the realities within a state which retain control over the social context on the ground. It also reveals the continuing power of the Egyptian authorities to control the context within which debates take place, aided by an unreformed state media. For the residents of El Dabaa, the fate of their campaign remains uncertain. But they have negotiated one key success for now: following negotiations with the military, the displaced have been allowed to return to their land. This victory may be temporary – the nuclear project seems far from being terminated – but it still represents a significant achievement that only became possible within an environment in which community movements are winning greater freedom to assert themselves. To ignore this struggle from below is to misrepresent the potential of Egypt’s unfinished revolution.